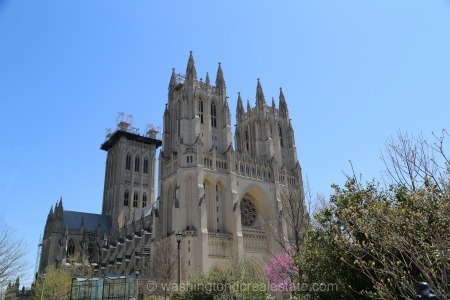 Cathedral Heights is a slender, residential neighborhood situated west of the stately National Cathedral in the northwest quadrant of Washington, DC. Its quality public and private schools, green spaces, and affluent demographic are a strong draw for many home buyers. Residences range from large condo and co-op buildings to detached homes in the Colonial, Craftsman, and Cape Cod styles. Regardless of the architecture, single-family homes are well maintained, and in short supply. Even with the District zip code, Cathedral Heights provides a quiet, residential feel, removed from Downtown. A 20-minute walk from the Cleveland Park Metro Station, many residents rely on the many Metro buses going up and down Wisconsin Avenue or own cars because of the plentiful supply of parking. Cathedral Heights is bounded by Woodley Road to the north, Wisconsin Avenue to the east, Fulton Street to the south, and Glover-Archbold Park and Idaho Avenue to the west.